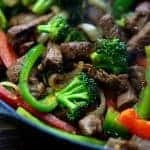 This steak stir fry is an easy meal to throw together any night of the week. Use whatever low carb veggies you have on hand! Heat a large skillet or wok over high heat. 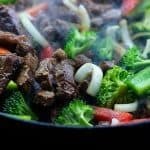 Add one tablespoon of vegetable oil to the skillet to heat. 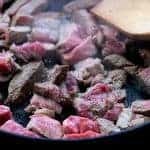 Cut the steak into bite-sized pieces. Slice the onion and bell peppers into strips. Add the steak to the skillet. Cook, stirring occasionally, about 3 minutes over very high heat. Stir in the broccoli, peppers, and onion and let cook for 5 minutes or until tender-crisp, stirring often. Stir together soy sauce, vinegar, honey, garlic, ginger, and chili paste in a small bowl. Add to pan and stir to coat. Cook 3 minutes, stirring often. The nutrition information was calculated by subtracting sugar alcohols in the honey substitute from the total carbs. If you do not subtract sugar alcohols, your information will vary.